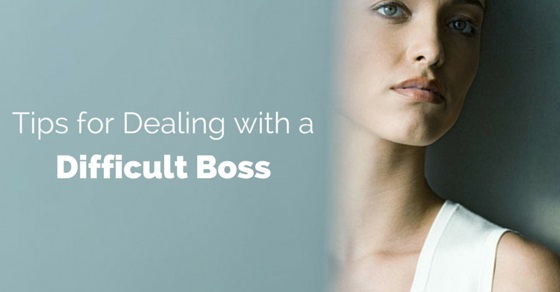 One of the main stresses that people go through in their work place is having to deal with a difficult boss. If you are facing this problem then you can rest assured that you are not the only one who is going through such a situation. Once bosses start demanding or expecting too much from employees they tend to become difficult to work with. Here are some easy yet effective advice to help you in dealing with difficult boss! Mostly bosses seem to act in an unreasonable and difficult manner when they find that their employees are not putting their best foot forward. So if you give it your best short and make sure that under all circumstances you respect deadlines and give up good quality work, then he or she will have absolutely no reason to be difficult when it comes to a commendable and hard working individual like you. In life you will learn that no matter how much pressure you are put under you should never ever give up on your beliefs and views. A person who clings by his or her beliefs at all costs is truly a person of character. So no matter how difficult your boss is show him that no matter what, you are going to hold your own. This will not imply that you are a disrespectful person; it will bear testimony to the fact that you are a person of strong will power. Nothing would appear more unprofessional that if you were to suddenly burst into tears or start pouting when your boss is in one of his ‘difficult moods ‘and is refusing to listen to anything that you have to say. If you show sign of weakness then a strong personality like your boss is sure to take advantage of your naïve and vulnerable nature. You must realize that at the work place there is no one else who will be willing to stand up for you, you have to stand up for yourself! No matter what, at no point should you shy away from putting forth your thoughts especially if your thoughts are not in consonance with that of your boss. You should not agree with your boss just because you know that your boss is a difficult person. Just remember , initially he or she might not like it but over time they will realize you are not one to just go with the herd . When your boss is being difficult just stop for a minute and think for a while if your boss is just being difficult for the sake of it or whether or not he or she is actually right. At no point in your life should you get so smug that you forget to listen to what others have to say. People are bound to respect you more when you are able to learn from your mistakes and accept constructive advice from others. At all times, no matter what your boss is saying remember that he or she has no personal cause to hate you! Make sure that you do not take anything he or she has to say because at the end of the day bosses are also human beings and since they have to deal with so much pressure often they end up saying things that they did not mean to say. If you were to meet your boss outside your workplace you might find he or she is a fun loving, jovial individual! After working with your boss for a considerable period of time if you realize that he or she is quite a volatile personality then make sure that you make a written record of all duties that are given to you to carry out. Make sure that you get him or her to sign it so that he or she cannot deny entrusting you with this responsibility at a later time. This might seem like a time consuming thing to do but it will help you in the long run! Initially the working with a difficult boss might get to you but over time you might get an understanding of all the tiny things you do that might set your boss off. In fact these things might not be exclusive to you. Take a close look at all the things, in general that might set your boss off and make sure that he does not come in contact with them, at least not as long as you are around. Doing this could really help you get through the day without much worry! One thing that might be the simplest and best way of dealing with a difficult boss is simply by talking it out with him. Telling him about the way you feel when he acts in a particularly difficult way could really help improve your relationship with your boss. You never know, your boss may appreciate your honesty and make amends in manner in which he or she behaves to not only you but other employees as well. Irrespective of what is being said to you, you must try and keep in mind that this is only to help improve your work so you should try and keep you cool under any circumstances. If you are young, you might find it difficult to keep your mouth shut when your boss is being difficult, however over time you will realize that in a corporate environment time is money and no one has the time to care for social niceties. No matter how difficult your boss is, it is up to you to make sure that you do nothing that is unbecoming of a person who is working in a reputed company. Just remember that anything unprofessional that you do is sure to be mentioned on your resume so make sure that in a moment of haste you do not jeopardize your future. Learning to keep your cool from a young age could really help you survive in the present cut throat business world of the 21st century. When dealing with a difficult boss it would benefit to inquire from people who were working in your position previously and asking them whether the boss would always act in this manner. If yes then you know that it is nothing you can do, that’s just how he or she is, but if the answer is no then you ought to reconsider what you do that causes him to act in this manner and whether or not you can improve yourself. Over time if you are to realize that your boss is actually a good person at heart who simply has the best interest of the company and its employees at heart then you should simply try and accept him for who he is. Bosses are most often elderly people, so trying to bring about a change in him would be near impossible. Just remember that he would have never reached his position of authority if he was not a capable individual who knew what he was doing! If your boss is being difficult just for the sake of being difficult then, nothing will annoy him more than seeing that you take no notice of his difficult personality. As long as you do your job well he or she cannot officially fire you and overtime he might have no choice but to give up acting in this way. Finally if your realize that your boss is being difficult only with you, because he some personal issue with you then make sure you go up to him and ask him why he or she acts in this way. If he has a genuine reason then you can try bringing about a change in yourself, However if you realize that he dislikes you for some illogical and shallow reason then make sure you do not stand up any such nonsense and give in your resignation immediately! These were some easy tips that you can follow so as to make sure that you handle your difficult boss in the right way. However you should try and remember that most often bosses are difficult and demanding only to bring out the best in you. However if it goes too far and you are unable to handle it, then don’t hesitate to give up your jobs. There are plenty jobs out there for you where your work would be be highly appreciated.